Quavo tweeted that he wanted to show Clemson "how champs are supposed to be treated." ATLANTA — When he’s not in the kitchen with his wrist whipping things up like its stir fry, Migos front-runner Quavo has a solution to a controversy that’s been bugging several college football fans this week. The rapper went to Twitter to offer the Clemson Tigers an invitation to party with the “Bad and Bougee” star, after the college football team was served fast food while visiting President Donald Trump at the White House. Photos taken at the White House show Wendy's burgers and Big Macs from McDonald's served on silver trays. French fries were placed in Presidential cups. 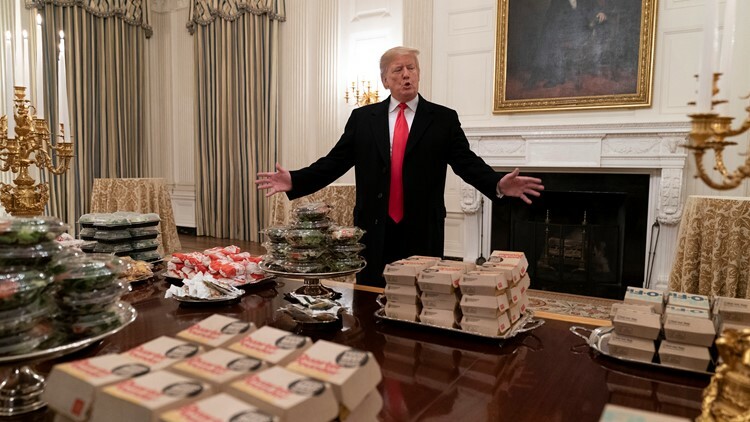 WASHINGTON, DC - JANUARY 14: (AFP OUT) U.S President Donald Trump presents fast food to be served to the Clemson Tigers football team to celebrate their Championship at the White House on January 14, 2019 in Washington, DC. While an invite to the nation’s capital is typically a prestigious honor, President Trump’s gesture of treating the players to a buffet of fast food was not well received by many, including Quavo. “I WANNA SHOW CLEMSON TIGERS AND POTUS HOW CHAMPS ARE SUPPOSED TO BE TREATED YALL WELCOME TO COME BY THE QC HEADQUARTERS ANYTIME Dabbin DABO STILL #GODAWGS The Stir Fry Way,” the rapper tweeted. Trump has a history of eating fast food regularly and has long touted his love for McDonald's and Kentucky Fried Chicken while on the campaign trail.